Chelsea fans are running out of patience with Argentinian arrival on loan from Juventus. Amid major concern for striking option, Chelsea supporters want Sarri to replace Gonzalo higuain. Chelsea fans seems impatient with 31 year old Argentinian arrival on loan for Juventus and are not very happy with his performance since January. The Argentinian was a big January arrival on loan from Juventus, but he has failed to live up to his Maurizio Sarri billing. The striker was the man Sarri always wanted and wished for, having enjoyed a fruitful spell in front of goal while the two were at Napoli together. The duo worked really well at Naples yet could not work out in the same manner at Stamford Bridge. However, Higuain has struggled to adapt to life in the Premier League, scoring just three goals all against relegated duo Huddersfield Town and Fulham. The 31-year-old was named on the bench for the Blues’ defeat to Liverpool at Anfield on Sunday, coming on three minutes after Chelsea fell 2-0 behind. 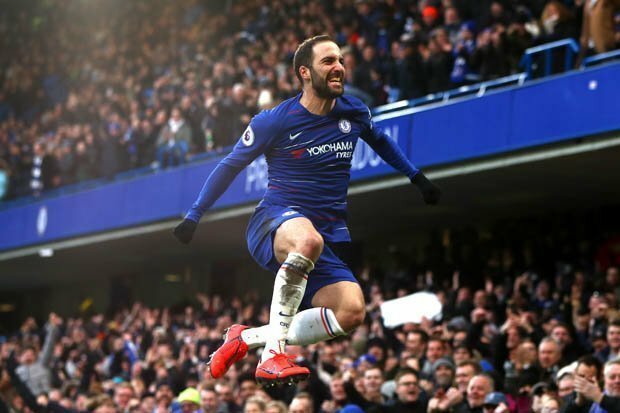 Higuain joined on an 18-month loan deal in January, meaning he has another season at Stamford Bridge, and with a transfer ban currently hanging over their heads, the Argentine’s stay is unlikely to be cut short and that he has another year to adjust and perform better. However, if the transfer embargo is lifted, while an appeal against it is heard, the Blues would be free to use the summer window to bring new players to the club. And the Chelsea supporters are already keen to see the back of Higuain, with many suggesting there is someone already on the books at Stamford Bridge that can replace him up front. Tammy Abraham an English striker has spent the season on loan with Aston Villa in the Championship, scoring 24 goals in 36 appearances. He has never been given a proper run in the Chelsea team, hence the third loan spell of his career, but now could be the time to get that chance. Here’s what the Chelsea fans have been saying on Twitter following Tammy’s comeback. Tammy Abraham would do no worse than what Higuain has done for us. Send higuain back to Milan. The loan is very useless and worthless. Bring back Tammy Abraham and Reece James. Even if we do we need to utilize players like Mount, James and Abraham, not a chance Abraham could do any worse than Higuain. The Argentine striker is yet to prove that he is the right man to lead the line for the Blues in the future and whether Chelsea should extend his loan deal. He needs to score more to prove Chelsea fans and Maurizio Sarri that he fits the Premier League and also to the way the team plays. What was the message Arsenal Spanish coach sent to his team before Naples win? Arsenal Frenchman hinted about his reduced playtime as he has been frequently subbed out.